FreeSpirit : All over for this year. All over for this year. 8 am and we were away. Our final cruise looked to be perfect with the promise of a nice day, the sun was out and not a breath of wind. But that changed quite quickly when the clouds rolled in and the breeze picked up. And then it became cold, very cold...in fact bl**dy freezing. 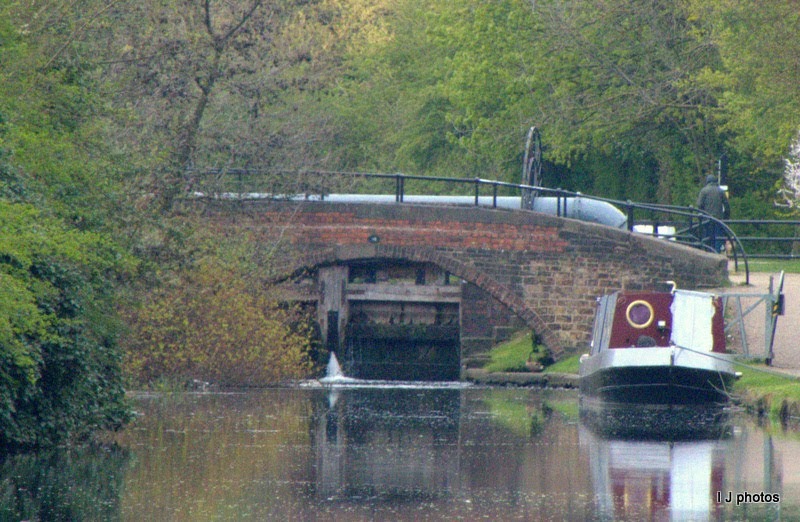 I didn't bother with too many photos, been there, done it all, got the T-Shirt but I thought I would show three of the four very low bridges that have to be negotiated carefully when entering or exiting at Sandiacre, Hallam Fields, Potters and Shipley locks. Also, another necessary item needed on this canal is a handcuff key, also known as the anti-vandal key. To keep the 'little darlings' from emptying a pound, a steel plate goes onto the spindle to stop the paddles from being lifted. To open these the anti-vandal key is used. It appears that many are missing from the locks and those that are still there some are not working due to the 'little darlings' already having vandalised them! Oh and beware of opening the top lock ground paddles at Barkers Lock to fast as you are likely to get soaked! Much to my amusement and Ian's annoyance, it's the sudden whoosh of air as the paddle is lifted that caused a jet of water to shoot up drenching Ian from the waist upwards. Just before the final three locks of today, a fishing match was taking place. Apart from having to creep past so as not to disturb their swim, which in itself is a pain, the fact that on every lock they were also fishing from the lock landing making my blood boil. I think its time C&RT explain to the fishing clubs that a lock landing is not an acceptable fishing platform. Took us nearly 6 hours to get back because, apart from two, every lock had to be turned which added another 60 minutes on our timings. We have settled FS on her moorings, the aerial is up and we have hooked up to the electrics. What will happen to us now is mainly dependent on the NHS appointment waiting times and hospital visits. So to everyone who will be starting their cruising at Easter, to everyone that is already underway and to all of you that cruise continuously, we wish you all a great Summer season filled full of adventure and masses of fun. And the final wildlife of today. Best wishes for a good outcome and hope whatever treatment is recommended is not too onerous. I hope we may see some wildlife pictures now and then? On another subject, I haven't noticed any blogging about fishing recently. Have you stopped? Dave has decided not to fish any more (though he may if he wants to catch something to eat). He says it is very obvious that fish don't enjoy being caught and it has stopped giving him any pleasure. We'll miss your blog - hope you can get out boating or at least in the motor-home later in the yesr. Iv'e enjoyed reading your interesting account of your cruising this year, accompanied by grrreat photos especially the wildlife ones. Wishing you well for the coming summer months. I've been trying to send you an email but it just bounces back to me. It's a Yahoo address that I have - have you changed it? Were my eyes deceiving me? Thats never a crocodile...surely not! Cyclists might have something to say to this!